The most important component of a garment is the fabric. It doesn't matter how well crafted the seams of the garment are – if it the clothing is made from the wrong fabric, it will not do justice to the design and will look like a disaster. Be excited to go fabric shopping! 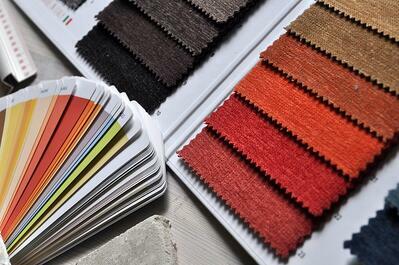 Prepare yourself mentally, and enter the store with a picture of your design in your mind (or hand), aware of the colors you want and a really specific idea of how you want the final garment to look. The weight of a fabric is measured in GSM (grams per square meter) and it defines how heavy or light a fabric is. Don't worry, you don't have to measure the fabric's weight at the store. Measuring the fabric weight is a way of measuring the thickness of the material, and differentiating between light-weight, medium-weight, or heavy-weight fabric. 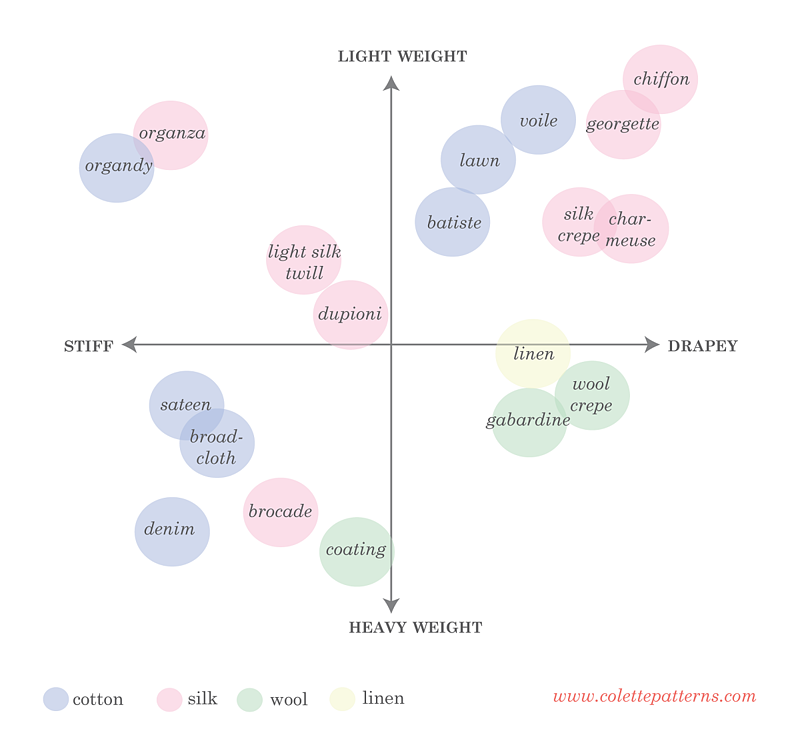 Here are some fabrics defined by their category (these categories may change depending on how the fabric is treated; dyeing and printing can affect the fabric weight). The drape determines how the fabric flows. In other words, stiff fabrics have less drape, and fluid fabrics have more drape. Easy! But be careful with this term. Drape is often confused with weight, but they are two different factors that affect how garments look. A fabric with more drape will make the skirt float away from your body, contrary to a fabric with a soft drape which will make it fold close to your body. For example, if you want a flowing skirt, you should pick a thin and well-draping fabric, but if you want a more structured skirt, choose a stiff and thick fabric. Stretch is how much your fabric stretches. Fabrics have different elasticity (ability of textile fibers to “bounce back” when they are stretched). 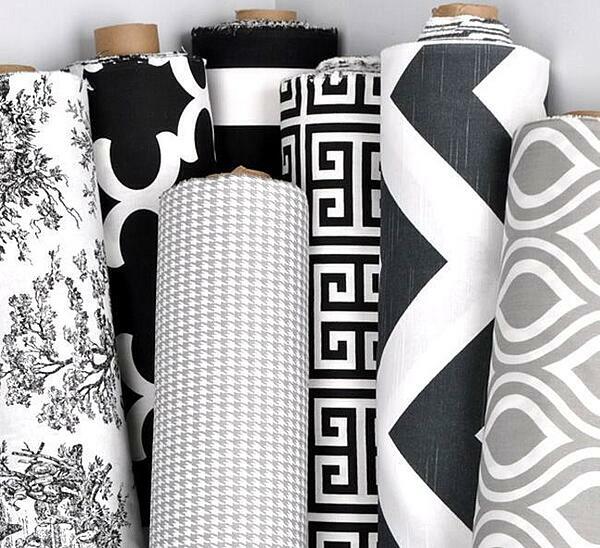 When you are choosing a fabric with stretch, you have to be sure that it works for your pattern, because it can change how the final product fits the body. To measure the stretch of a fabric, stretch 5” of fabric over a ruler, holding one end on the zero mark and stretching the other until you feel resistance and then divide that number by the original length of the fabric. For example: if your fabric stretches to 7.5″, it stretched 2.5″ past the original length. This is 50% stretch. Calculation: 2.5 (amount it stretched) / 5 (original length) = .5 x 100 = 50%. Now, it's time to go shopping and practice what you learned! 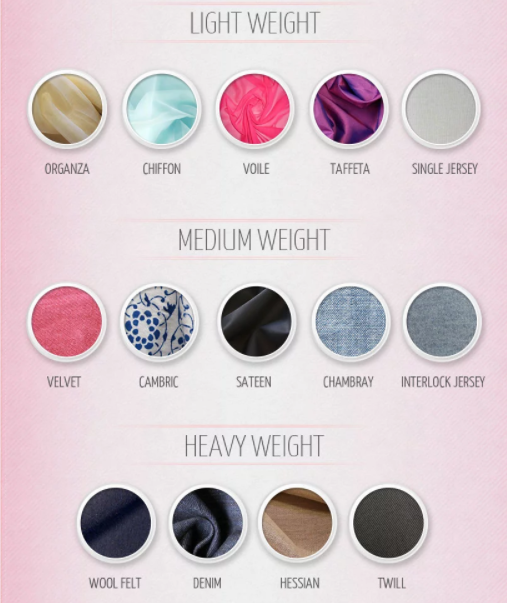 The MakersValley Platform makes it easy to tell your manufacturer the type of fabric you want. Sustainable fashion is a trend that’s here to stay, and the environment is better off for it. Business Insider recently reported that at least 8 million tons of plastic enter the oceans annually – so much plastic that a dutch inventor named Boyan Slat has pioneered a 2,000 foot long plastic cleaning device engineered to reduce plastics contamination of the Earth’s seas. Fashion manufacturing has always generated a significant amount of waste, but that’s slowly shifting.